Welcome to Rapidmove Limited. 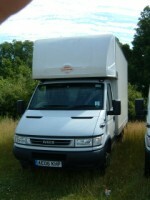 Established in January 1993, the company now has over 25 years' experience in the removals industry. We offer domestic and commercial removals, local or national. The company is based in Wilmslow, Cheshire with another office in Cheadle, Stockport. The range of services available includes a man & van service, house removals, office removals, part-moves and single items, and house clearances. Although we mainly carry out removals in Cheshire & Manchester, we do offer a nationwide service. We are the first-choice transport company for many antique dealers in Cheshire - see the antiques page for more information. A great deal of new business now comes via recommendations from satisfied clients. See our testimonials page to see what people say about us! References available upon request. We operate Cheshire and south Manchester's premier Man & Van service. This service is proving extremely popular with people who may only want a few items moving or who are happy to help with the loading. Extremely cost-effective, single items cost from £10.00 to move! You get one of our operatives (with a van of course!) who will be very experienced in the correct moving of furniture, who will know how best to load the van to maximise the available space. Vans are fully equipped with blankets to protect your goods, ties to secure your goods and trolleys for moving heavier items. Just call 07774 171933 with your requirements. We offer storage facilities and a packing service. If you'd prefer to carry out your own packing, we can supply all the boxes and packing materials that you need. The boxes that we supply are of a high quality & are the ''proper'' boxes used throughout the removals industry. Our house clearance service is proving popular - we are now able to clear everything including all rubbish - see the House Clearance page for more details. We aim to reply promptly to e-mails. We are very flexible & approachable - if the planning of house or office removals is an unfamilier subject for you & you're not sure of something - please ask! You don't need to spend any money with us to ask for a bit of advice. 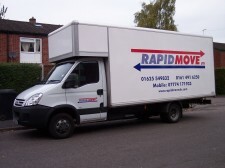 Copyright Rapidmove Removals Cheshire Manchester 2019©. All Rights Reserved.